Update @ Sat 17th Feb — The source code for this project is now available from my GitHub repository. Update @ 8th Mar 2018 — Currently the DHCP option doesn’t work (timeouts/WDT-resets). 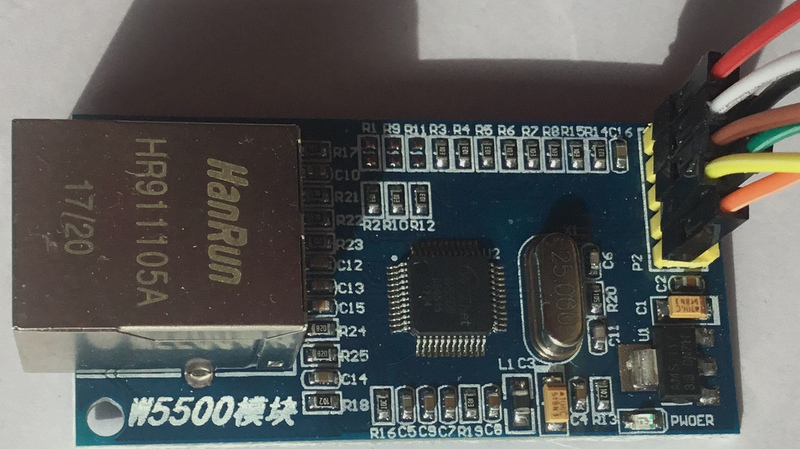 The IP address of the W5500 will need to be set manually in the code (thanks to “1rabbit” for the heads-up on this issue). Update @ Fri 5th April 2019 — Here’s the simple ESP32/W5500 NTP client example. The ESP32 wiring is even easier (no buffer transistor required). A few months back I pointed readers to an article by Frank Sautter on adding an Ethernet port to the ESP32 which I found quite interesting. It reminded me that I’d been playing around with a Wiznet wiz820io board a while back on an older PIC-based project, so I pulled it out of the parts drawer and started fiddling with trying to get it working with an ESP8266 module. There were some signs of life, but it was so flaky that I really didn’t quite know whether I had dodgy hardware or whether my graft of the ESP8266 code from the W5100 library to the W5200 library was just crap (the latter being a very strong possibility). It had whetted my appetite though, as I was looking for a means to interface an ESP module to my LAN as an ESP-Now gateway. So I ended up getting one of the (cheap) newer W5500 modules (the one with the yellow pin header and the “PWOER” LED label)‡ which are popping up all over the place at the moment at about $4 shipped (click on the picture on the right to see the full-size image of the board). The W5500 handles more sockets than the older versions of the chip and is generally recommended for newer designs (it’s a little cheaper, too). Although the W5500 needed a little tweaking to get going, there weren’t any serious issues with either the hardware or the software and it didn’t take too long to get it working. One issue (which is actually an ESP problem, not a W5500 one) is that the chip-select for the external SPI is actually routed via GPIO15 and, as we pretty much all know from experience by now, that’s one of the “magic” pins at boot-up/reset which changes the way that the ESP8266 behaves. In fact there’s a pull-up resistor on the W5500 (and, as far as I know, all of the other Wiznet modules) CS line which will cause the ESP to drop into programming mode if the W5500 CS line is simply connected directly to GPIO15. The solution to that is quite easy — put a PNP transistor buffer (configured as an emitter follower) between the two. Because of the pull-up on the W5500 board, you don’t need an emitter resistor, but you do need to add a base resistor of somewhere in the region of 3k3 between GPIO15 and the transistor’s base (and the collector of the transistor goes directly to ground). Any small-signal PNP transistor, such as the BC560 or 2N3906 should work in this situation; it’s not that critical. This fix should work for pretty much any SPI connected peripheral board …but you might have to add the emitter resistor if the target board doesn’t already have a pull-up. The pin numbering for the NodeMCU boards is given on the left, with the standard ESP8266 GPIO numbers in the centre column. In addition to the data pins shown above, you need to connect ground and either +5v -or- +3v3. The W5500 board has its own, on-board voltage regulator, so a +5v supply is okay, but sharing a 3v3 supply with the ESP8266 is a more likely scenario in our case (the data pins on the W5500 are 5v tolerant, by the way). On the software side, I ended up using the Wiznet Ethernet Library for the Arduino 1.5.x IDE. It hasn’t been updated in a while …but the last updates were to add the ESP8266 hooks into the code. There are good instructions in the README.md file on how to install and use it, but –don’t– uncomment the “#define WIZ550io_WITH_MACADDRESS” line referred to in those instructions. The normal, cheap W5500 boards do -not- have a built-in MAC address and you must set one manually in software before you can use them. All in all, it really was quite easy to get the W5500 ethernet board not just connected to my LAN, but also talking to my MQTT broker to both publish and subscribe. Sometime in the next couple of days I’ll try to get around to sanitizing my code to the point where I can throw it up on GitHub as a simple example, but even before then, I’d say this is a safe enough purchase[¹] for anyone who wants to muck around with a wired connection to their ESP8266; you’re not going to break the bank if it doesn’t work as expected. [‡] – Link provided as a convenience. This is where I bought mine. I have no relationship with this seller, other than being a satisfied customer. Thank you very much for this detailled and well-written article! by the addition and usage of the Ethernet parts? The WiFi is still operating as normal. In fact the ESP8266 still gives priority to the WiFi, while the dedicated microprocessor inside the W5500 handles the low-level processing of the wired network traffic. One of the things to remember about this configuration is that we’re not asking the ESP to do too much heavy lifting. As it stands, the example code is simply passing (relatively infrequent) messages to a single MQTT server. It’s nothing like the ethernet port on your Linux box, which is handling multiple services on multiple ports (DNS, NTP, SSH, HTTP, DHCP, etc). You still need to make sure (as with anything you’re writing for the ESP8266) that you leave the processor enough free cycles to handle the WiFi stack, but other than that, it should be quite possible to add services to the W5500. The Ethernet or Ethernet2 libraries available online (not the cut-down version in the lib directory of my source) has several complete reference programs under the “examples” directory which should be fairly easy to implement (for instance, adding an NTP client to ensure your gateway always has the correct time). Thanks a lot for all your explanations, John! As a very broad, general statement from someone who doesn’t know …I have also heard that things like this can be made to work, but don’t generally leave enough space for any useful applications. Thanks for the explanation of setting up W5500 and Nodemcu. I can compile and upload the sketch but I fail to set the IP address of the W5500 Ethernet port. The serial monitor shows “Ethernet IP: 255.255.255.255”. Your advice is much appreciated. Thanks. This is a pretty good indication that your ESP isn’t actually talking to the W5500 at all. Double check all of your connections for continuity, especially the CS line (also check that your CS buffer transistor is a PNP, -not- an NPN and check that you can see approximately 10k between the emitter and the positive rail). If everything there looks good, make sure you also have a good, stable power supply to the W5500 board. It sounds like this is a very basic issue, so it (hopefully!) shouldn’t be too difficult to solve. Let us know how it goes. Thank you for your advice. There was a misplaced color wire. It shows an IP address now but it is just a random number. The PNP transistor is 2SA733 and a stable 5V power supply is used. Your attention is appreciated. Thanks. Great, sounds like you’re getting there. The latest results still sound like a hardware issue, though. Your ESP and W5500 are trying to talk, but something is out of sequence, so now you’re looking at an issue with the reset or CS lines (possibly even the clock line). I’d do a continuity check on your wires (or just replace them, one by one, testing in between) and double check your transistor connections (the 2SA733 should be perfect for this application, but it does have a slightly unusual pin-out, according to the data sheet — E,C,B, looking from the front). If you’re unsure of the transistor, you could always replace it with a non-inverting buffer, such as a 74LS07 (or, just for testing, you can get rid of it completely and add a long delay, maybe five or ten seconds, after start up to give you time to manually insert the CS line into the NodeMCU pin socket). Thanks for your advice. There was also a ground wiring issue. I am getting core dump after showing a random IP address now. I used a transistor tester to test the transistor and it was fine. I checked the SPI on the Nodemcu using a TFT LCD display and it was fine too. When I disconnected CS, CLK, MISO or MOSI line, the core dump stopped. The RST line did not make any difference either connected or disconnected.The LED on the Ethernet socket showed traffic on the Ethernet cable. You may have answered your own question with this one. If you disconnect the CS/CLK/MISO or MOSI, you’re effectively disabling the SPI connection completely. RST is effectively one way …the ESP is meant to hold the W5500 in reset until it has completed its own housekeeping start-up tasks. It sounds as though that isn’t happening and the W5500 is overwhelming the ESP with SPI traffic before it is ready to deal with it. While the other pins are “set in stone” (those are the pins which are defined in the hardware for the SPI interface), the reset pin is not. You can move the reset onto any free GPIO (although it makes sense not to use either GPIO-0 or GPIO-2) and just change the define for RESET_P in espnow_gw.h to match. Great work, amazing. I am trying same thing with ESP32 dev board. I am using gpio 5 as CS pin and GPIO 4 as w5500 reset. Not using buffer, straight connection. I’m in the middle of doing the same thing (if only real-life would grant me some spare time to work on it). The ESP32 code is very different and, of course, the hardware connections are different, too. You’re right; the CS line doesn’t need a buffer to work with the ESP32, so a couple of components less. I chose GPIO26 for the reset because it didn’t have any pull-up/down configured (GPIO4 has an internal pull-down) and because it didn’t clash with any other peripheral pins that I want to use in addition to the W5500 (I’m planning on using the I2C bus and on adding a couple of WS2812 LEDs for some see-at-a-glance debug indicators). I had to use an explicit call “Ethernet.init(5)” to get the CS to work on the ESP32 (setting pinmode as output isn’t enough). There was also a fairly recent change to the SPI library which hadn’t made it into the mainstream library when I started working on this, so I needed a local version of the (new, updated) library. Right now, I only have the initialization and connection to the MQTT server working, but I’ll sanitize the code and try to get it up on GitHub sometime in the next couple of hours.